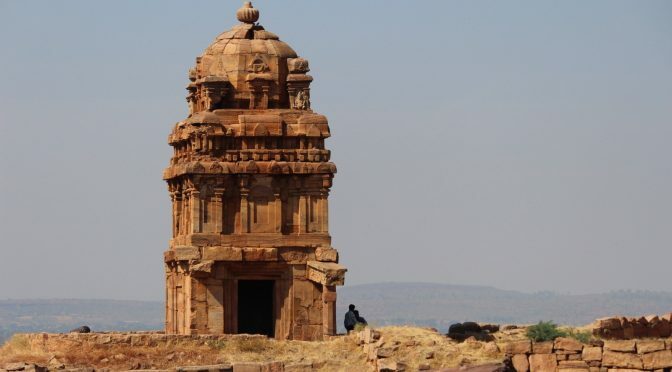 Caves, hills, rocky temples and forts; these are the things that are fascinating in Badami. If you are wondering where Badami is? It is a small town situated in northern Karnataka and has been widely known for both its history and rocky monuments. It is a such a shame that a place like Badami is less known to us, as Karnataka is dominated by both Banglore and Mangalore and Gokarna too. The place is filled with stunning infrastructure and the eye-catching view from the hill top, which makes this place extravagant. And if you ever feel lost and wants to search your soul, this place is going to be a soul searching experience. The common language spoken is obviously ‘Kannada’, but knowing Hindi will definitely help you. The way to the rocky caves and hills is not easy, and if you are tired the sun won’t help you in the open sky. So pack your bags well, a bottle of water will do much help. There are a handful of temples in Badami but which stands out is ‘Bhutanatha temple’ of Lord Shiva. And if you are into trekking, take a camera with you and don’t forget to take snaps as these caves and hills stand as the sole evidence of the forgotten memories of what our country was known for; ‘Incredible and Phenomenal’.